Order info: www.oup.com/uk -- use code AAFLY7. No postage costs within UK. This book will be accessible as e-book in many libraries. 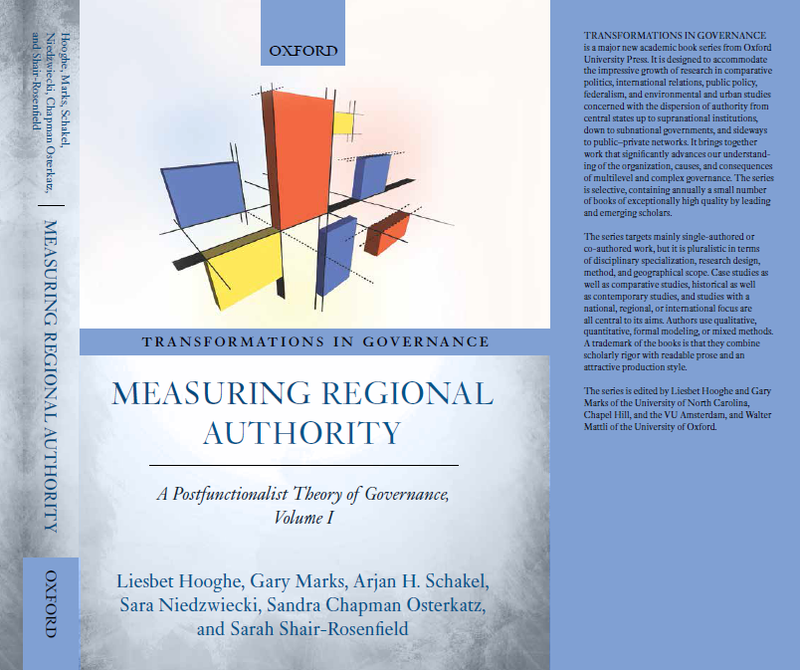 The Regional Authority Index is a measure of the authority of regional governments in 81 countries on an annual basis across ten dimensions: institutional depth, policy scope, fiscal autonomy, borrowing autonomy, representation, law making, executive control, fiscal control, borrowing control, constitutional reform. These ten dimensions constitute two domains of authority: self-rule, or the authority a regional government exerts within its territory; and shared rule, or the authority a regional government or its representatives exerts in the country as a whole. The dataset encompasses subnational government levels with an average population of 150,000 or more. The sample consists of all EU member states, all member states of the Organization for Economic Cooperation and Development, all Latin American countries, ten countries in Europe beyond the EU and eleven in the Pacific and South-East Asia. The unit of analysis is the individual region/ regional tier. Where appropriate, we code more than one regional tier, and code separately regions with a special statute or asymmetrical arrangement. Individual regions with a special statute are included even if they do not meet the population criterion. Primary sources (constitutions, legislation, statutes) are triangulated with secondary literature and consultation of country experts to achieve reliable and valid estimates. The book that accompanies the dataset, Measuring Regional Authority, provides extensive discussion of conceptualization, operationalization, and measurement decisions; compares our measure with alternative measures; guides the user on how to interpret its application to gray cases; provides source justification of each coding decision in detailed country profiles.